Haul Road Hunting and Conditions- Updates Please! Thread: Haul Road Hunting and Conditions- Updates Please! Please use this thread to give updates on Haul Road conditions and Animal Activity for those of us getting ready to venture north. This Thread is for all of us Bowhunters or others out here that just want to go hunting, dont care about crowds, would like updates, and dont want to hike (yes even 1/2 mile) from the road if we don't want to. After all - this IS still part of the Land of the FREE! To the Moderators of this here Forum - feel free to delete it once the highjackers and name callers get a hold of it. Until them - please - there are some of us out here that just want to hear about the hunting and the conditions - not about whos right and whos wrong. As of Monday the road was awful!!! Lots of rainfall meant it was full of huge chuck holes and washboards. South of the Yukon was the worst spot. We were going five mph in spots because the washouts were so bad. Caribou were mostly between Happy Valley and Galbraith. Scattered bands all along the road, but no big herds. Quite a few hunters out, but I only saw one group that looked to be competing for a lone dink of a bull. Most of the animals were far enough off of the road that nobody was hiding in the ditches or truly road hunting. Bowhunters were definitely putting in some hoofing time to get to them. Plan on at least 12 - 14 hours from Fairbanks to Deadhorse not including stops. It's rough driving right now thanks to all the rain. I'm heading up this weekend, but not for Bou. Has anyone seen any bears between Coldfoot and the Pass? Good luck to the guys heading up for 'bou! And in the State Troopers reports yesterday they cited 9-10 people for: Rifle within the five mile zone, taking out antlers first, wanton waste and shooting cows. So they are watching people. Just talked to a gentleman last night that drove back this weekend towing his new boat. He hit a large hole that broke the tie downs for it and launched it off the trailer to the side of the road. Granted, he was most likely driving too fast for conditions but gives you an idea what to expect. As with many of you that I have read I will be driving up also around the first of September. It will be my first time driving the haul road and am looking forward to the trip. Hope you all have a safe and fun trip. Just spoke with a guy that returned Tuesday. It took them about 13 hours to get to Coldfoot from Anchorage. There was a little construction before coldfoot that had a pace car to follow. They said the bou were spread pretty thin and be ready for some hiking. The snow that had fallen over the weekend was melted north of Galbraith lake, but it was snowing and a little sloppy on the pass. I'm heading up tonight. Goodluck to those heading up - I'll prob be going around sept 1 or so. They are also writing tickets for parking in the road. Pull off the traveled surface before you get out of the truck. Just talked to a gentleman last night that drove back this weekend towing his new boat. He hit a large hole that broke the tie downs for it and launched it off the trailer to the side of the road. 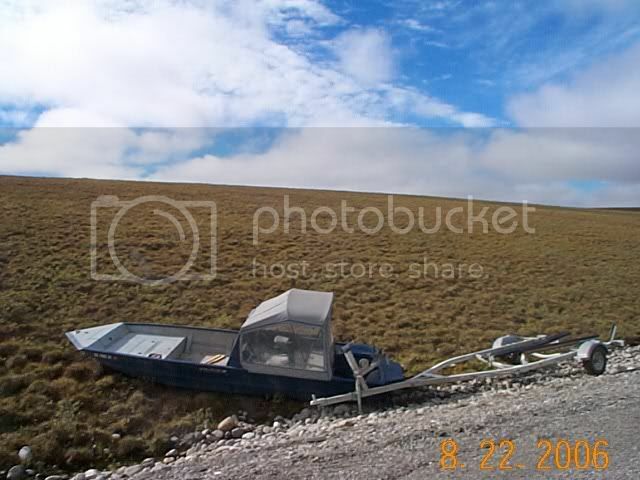 I didn't talk to him but I did take a picture of the boat along the road. The water level looks a little low to launch there! I have heard that they "can run on a damp floor". pray for rain! Should have seen the look on his wifes face while he was telling me the story! PRICELESS! TOO Funny. Made he's waiting for the incoming tide? they said the road is in much better shape than when they went up last week. It is better but don't get in a hurry. Monday night a SUV hit some of the large holes on the Beaver Slide and flipped several times, he did not live to tell about it The maintenance on the road is very poor most of the time.. It would be a great Idea to have a Haul Road Conditions Sticky. Year Round!! After all - this IS still part of the Land of the FREE! Don't forget the Land with Freedom of Speech there buddy!! I figured I would give this thread 2-3 weeks to die out before I pointed that out to you. This is a great topic with rules, by the way. Please don't brand those who want to use this forum for discussion/debate.